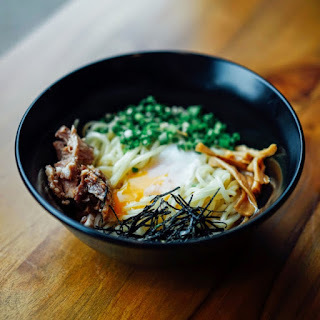 Monohon Ramen are hosting two 90 minute suppers in Stoken Newington on Sunday 1st November, as part of the 10 year celebrations for the ROUGE shop at 158 Stoke Newington High Street. They'll be serving Abura Soba is a soup-less ramen. A bowl of thick and chewy noodles with a sesame-oil based sauce, with sittings at 5.30pm and 7pm. Tickets are just £10 each, and it's BYOB, so snap them up! "Fashion designer turned shopkeeper Lei Yang stocks vintage furniture, textiles, ceramics and artwork from Japan, China and elsewhere in the Orient at her beautiful shop ROUGE in Stoke Newington. As part of their 10th anniversary, Monohon will serve Abura Soba. Hugely popular in Japan but largely unknown here, Abura Soba is a soup-less ramen. A bowl of thick and chewy noodles with a sesame-oil based sauce. Toppings include slow braised pork, onsen-tamago (very soft poached egg), menma (marinated bamboo shoots) and more. We'll demonstrate how to make the dish and then invite guests to assemble their own bowl choosing their favourite toppings. Tickets also include a bowl of edamame. There are two seatings for this event, each lasting 90 minutes including the demonstration. Feel free to BYOB."